Note: FMR, community groups and artist Liv Novotny are working together to create a third water quality mural in 2019. For St. Paul's Lake Como and many others, one main reason is nutrients that come from neighborhood lawns and streets. After it rains, fertilizer, leaves and grass clippings are directed into our local lakes, creeks and rivers via storm drains, feeding algae and excessive plant growth. At Como, a pair of murals reminds us of this important connection between our yards, streets, lakes and rivers, while celebrating the community in the process. Painted by Gustavo Lira with input and support from community members, the first mural, completed in 2017, features musical notes and a treble clef in honor of music in the park at the Como Pavilion, koi fish to represent Como Zoo and Conservatory and a snapping turtle to represent the many turtles who lay eggs in community members' front yards. In addition to the clef and koi, the newly painted mural (also by Lira) features a lotus flower and hands representing our responsibility to care for our natural resources. While the murals are covered in a clear finish to extend their lifespan, the murals are meant to slowly wear away and be replaced in a few years with new designs. FMR looks forward to continuing to work with the city and neighborhood groups to paint new murals and highlight the connection between our yards, streets, storm drains and our waters. 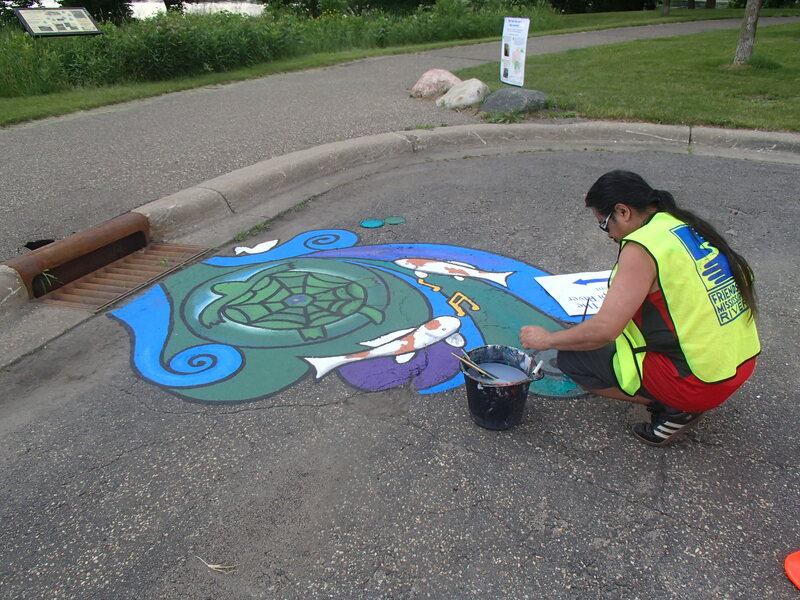 Artist Gustavo Lira touching up the first storm drain mural in St. Paul along Como Lake at the intersection of East Como Lake Drive and Lakeview Avenue West. Although it only took a few hours to paint each mural, they're the result of over a year of collaboration between the artist, the neighborhood group, the city and FMR. Both murals were designed and painted by local artist Gustavo Lira but many people and organizations helped design and complete them. Community members and the Como Active Citizen Network participated in a workshop to generate ideas for the mural by answering the question "What makes Como Lake special to you?" The mural was funded by the City of St. Paul Public Works Department, and support from District 10 Como Community Council and St. Paul Parks and Recreation made it all possible. If you live in St. Paul, FMR can work with you to stencil storm drains in your community. May through October, we work with volunteers throughout the city to paint the message “Keep 'em Clean, Drains to River!” next to storm drains and distribute related educational flyers to area residents. Request an outing online or contact FMR Program Assistant Daurius Mikroberts at dmikroberts@fmr.org. 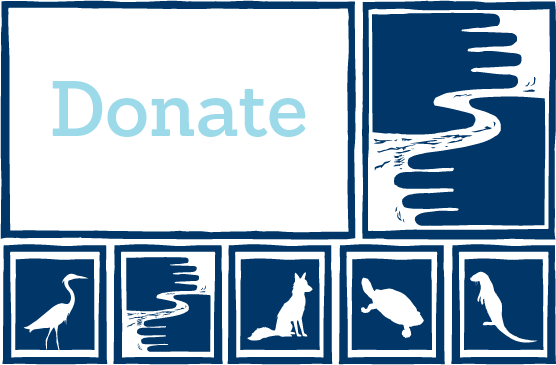 Wherever you live in the metro, you can help keep your local lakes and river clean by adopting a drain with our partners at the Center for Global Environmental Education.